At 17, in the beginning of her senior year, her entire life is already mapped out for her by her parents. Her father wants her to take over his practice when he retires, and her mother sees Paige's accomplishments as her own – to do well is to make her parents proud. Set on the career path of neurology, Paige must be better than 4th in her class, because she needs to get into Stanford – her father's alma mater. Unlike the rest of her fellow students, Paige's course load is heavy, and Calculus is bringing down her GPA, especially with a D.
Ben has what Paige needs, and she has what he wants. Ben will help Paige in Calculus, for payment: get him a date with her popular BFF. Finding Perfect elicited the warm glow of a first crush, the fear of rejection, and unrequited love. I recommend this title to young adults and those young at heart, and I look forward to the next in the series. Paige Westfield, also known as "Perfect Paige," has it all figured out: get into Stanford University, get into medical school, and take over her father's family practice. There's just one tiny hitch, she's failing calculus and she's starting to see her perfectly laid out future slipping through her fingers. Ben Franklin is a smart guy, but he's from the wrong side of town and wearing the wrong kind of clothes. Fortunately, Ben has been crushing on Paige's best friend, Zoey, the hottest girl in school, for as long as he can remember, and he'll help Paige pass her calculus class if she can make him into the kind of guy Zoey would date. 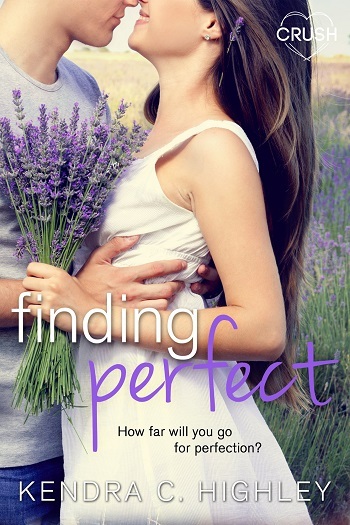 I really liked Finding Perfect, it was a nice quick read with the perfect blend of romance! Paige is such an easy character to relate to, and Ben was just too cute! Also, I was pleasantly surprised with how much I ended up liking Zoey, her best friend, and I am totally looking forward to reading her own story in book two. I will say some of these YA books make me feel like I'm too old to be reading them, but this definitely isn't one of them. If you're looking for your next summer beach read, this one will be a perfect fit! For fans of Kasie West and Jenny Han, this book is a must read! Reviewers on the Wicked Reads Review Team were provided a free copy of Finding Perfect (Finding Perfect #1) by Kendra C. Highley to read and review. Review copy was purchased by the blog.